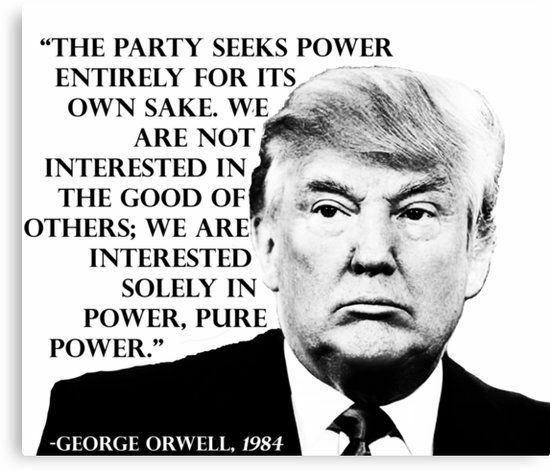 This quote from George Orwell’s 1984 seems eerily relevant today, doesn’t it? It has become ever more clear that power is the one thing, the only thing, that matters to the #BLOTUS and the Republicans in Congress. If you need an example, which most thinking folks don’t at this point, just look at the complete Republican support of Roy Moore to fill the Senate seat vacated by Jeff Sessions. Having another Republican vote in the Senate outweighs any question of improper or immoral behavior. The many-times accused molester in the Offal Office has said that having a Republican like the accused child molester, Roy Moore, in the Senate is far preferable to having a Democrat, any Democrat, fill the seat. Moore not only has been accused by numerous women of involvement with them as young and underage girls, the man has twice been removed from his seat as Judge. None of that matters. All that matters, the only thing that matters, is power, pure power. This entry was posted in News & Views, Quotes and tagged 1984, BLOTUS, caring, child molester, Congress, Democrat, evil, George Orwell, good, Jeff Sessions, judgeship, party, power, Republicans, Roy Moore, Senate, underage on December 6, 2017 by Ray Buchanan.